Justice is a really great read. In fact, it surprised me how good it was and how quickly I got hooked on it. I have to admit, I’m not crazy about the cover and would have skipped over it had I seen it on the shelf – maybe I’m not a pink person, but to me it looks much more like a romance novel than it actually is. In reality Rain Ramey’s story – it’s told from her first person POV – is predominantly a mystery, with smatterings of romance and school angst thrown in. 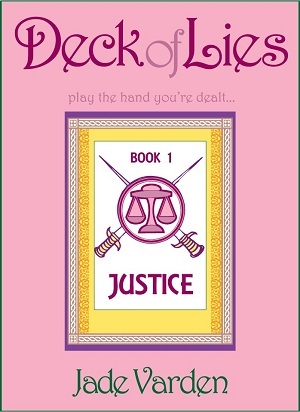 Because of the tarot connection and the details that emerge as she investigates the situation she finds herself in, I’d have preferred more sinister artwork to draw you in – however, I think the blurb IS good, which is why I gave this a go. (The author Jade Varden has contributed guest posts the blog, which was how I first saw this book – so look out for those coming later in February). Rain’s character is very well done – you really get a feel for her through her interactions with the other characters – and because of the out of control situation she finds herself in you can sympathise with her actions and behaviour. The fact that events come one on top of another adds to the pace of the novel and so there are mini-questions within the overall mystery. Some I guessed, others I didn’t, so I liked those aspects. Book 1 – it’s obviously a series – and so there’s some questions I’ve got from this book I’d like to see get answered and the new mystery thrown in towards the end is a good cliff hanger…I have my suspicions but will have to wait and see whether they’re right! Overall, a well written YA mystery – good pace and enough action to keep you reading (I read pretty much in one sitting) – look forward to seeing where this goes. And FYI – I’m rooting for RVR! When you build an entire life on a foundation of lies, it only takes one truth for the whole thing to come crashing down. I never invited the truth in. I never went searching for it. I never had any reason to suspect that the two people I loved most were dishonest with me every second of every day. I made one bad decision, and in a single day my entire world changed. If I’m ever going to discover the truth about myself and my parents, I have to trace all the lies back to their source. I have to try to find the truth that they’re hiding. The more I discover about myself, and my past, the more I realize that lies really are better than the truth. But now that I know the lies are all around me, I can’t stop until I’ve discovered them all. I’ll pull each lie away, one by one, and examine it to see what’s underneath…until this house of cards crumbles into dust at my feet. I just hope I can survive the crash.